Dasheria Barksdale tried to leave him, but he came back and killed her, her friends say. The 30-year-old was stabbed to death in Alexandria, Virginia, on Thursday by her boyfriend, according to police. The time when someone tries to leave their abusive partner can be the most dangerous, a manager at a Washington, D.C. domestic violence shelter said Friday, in the wake of at least three devastating attacks on women in the region this month. 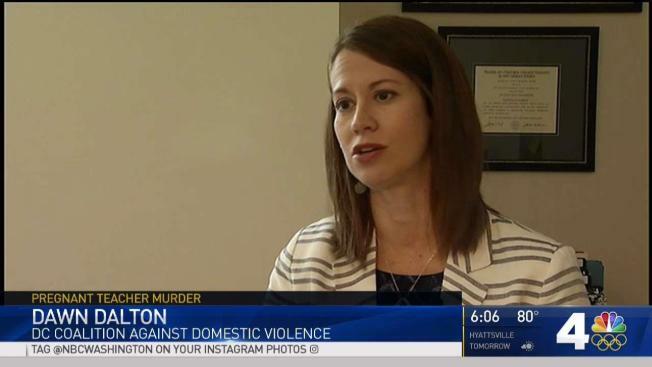 If you are ready to leave an abusive partner, you need a specific, detailed "safety plan," Chandra Robinson of My Sister's Place and other experts say. “Nothing guarantees, but you stand a better chance towards safety when you have a safety plan,” Robinson said. “Don’t try on your own. I think that’s the safest way." The tiny details of this plan could help save your life. “We advise how you should park in the driveway, just in case you have to run out and leave,” she said. My Sister's Place staffers practices these safety plans again and again with their clients, who mostly are women. It can take weeks or months to execute the plan. Here are some tips on how to start, from the domestic violence program in Arlington County, Virginia. •	Contact a shelter or family violence hotline to speak with an advocate about what help is available to you. •	Keep money, clothes, important documents and an extra set of keys ready just in case you need to leave quickly. Store these in a safe place, like a friend’s house or in a spot your abuser won’t find. •	Plan an escape route. •	Determine what time of day is best to leave. For example, does your abuser work during the day or at night? •	If you have children, practice emergency drills with them. Teach them how to dial 911. •	Include any pets in your plan. •	If you have a protective order, carry it with you. You may want to make extra copies to give to your employer or school. •	Discuss a signal with your neighbors or coworkers that you can use to call for help. •	Be prepared to protect yourself. Leaving a partner can be dangerous. Developing a safety plan may seem daunting. Don't be afraid to ask for help, Robinson said. “The victim is doing a disservice to him or herself to take all of this on by themselves. You’ve done enough just being a victim,” she said. Getting help with your plan from a professional is ideal, but family members, friends and coworkers who you trust also can help. A woman was stabbed to death in Alexandria, Virginia, early Thursday after she tried to leave her boyfriend, her devastated friends told News4. Julie Carey reports. •	Find someone at work who you can talk to about your situation, such as a boss. •	Give a photo of your abuser and a description of their vehicle to a trusted coworker. •	Move your workspace to a safe area. •	Ask your supervisor about policies and procedures that address domestic violence. Barksdale, the woman who Alexandria police say was killed by her boyfriend, was the third woman in the D.C. area who officials say was attacked by her partner this month. Her boyfriend, Melvin Williams, 23, put a knife to her throat early Thursday, police said. "He was saying, 'I told you, it's 'til death do us part, it's 'til death do us part. I told you I'm gonna kill you,'" a friend who tried to save Barksdale told News4. On Wednesday, the body of pregnant, missing high school teacher Laura Wallen was found in a shallow grave in Damascus, Maryland. Police say her boyfriend, Tyler Tessier, 32, shot her in the head and then said at news conference with her family that he was desperate to find her. Wallen was 31 and excited about her baby, her father said. Days earlier, on Friday, Sept. 8, Andrea Grinage’s boyfriend set her on fire in Capitol Heights, Maryland, leaving her with critical burns and forcing her to deliver her baby seven weeks premature, police and her family said. Laquinn Phillips, 34, was charged with attempted murder. Anyone -- regardless of their race, age, class or location -- can be a victim of abuse. “This is why I call domestic violence an epidemic,” Robinson said. One in 4 women and 1 in 7 men have suffered violence by a partner in their lifetime, the Centers for Disease Control and Prevention said in a national report published this year. If you need help, My Sister's Place in D.C. can be reached at 202-529-2991. The National Domestic Violence Hotline can be reached at 800−799−7233; they provide resources no matter where you’re located.